On Line Meditation Program, 16 December 12. I humbly surreder my thanks at the Lotus feet of our Mother. We five yogis enjoyed the online meditation. Thank you very much my dear brother and sisters. On Jalandhar seminar a Sahaji sister named Mrs.Seema shared her experience of that day.She always felt heaviness on her VISHUDHI CHAKRA.but that day when meditation to clear our vishudhi chakra was going on she felt something different ,you can say a miracle.She firstly felt heaviness on her chakra but soon she felt dat SHREE MATA JI herself was standing infront of her and was asking her to FORGIVE everyone .She said "mother i have done that ".But SHREE MATA JI told her to forgive everyone again but dis time with full heart.As soon as she did so she felt that mother came behind her and opened a knot of her vishudhi chakra and she started feeling cool viberations on her Sahastrara,which she never felt before.After receiving mother's kripa she was full of joy. Dear Sahaji Brothers & Sisters, Thank you very much for informing about the programme to be held on 1-2 December. EVS Rao. With all our pure love and respects. With the blessing of Shri Mataji, I could also enjoy the collectivity sitting at home in Delhi. Please include me in your mailing list. Heartfelt thanks to you all brothers and sisters for broadcasting the programme online. By the grace of Shri Mataji, The Program transmitted online from Jalander ( 1 dec 2012) was very very helpful. We all people feel the utter silence. I want to be the part of this Online program always from now. Requested you please send us the email or SMS of all the future programs. Jai Shri Mataji, Please may I request you to include me in your mailing list for the information about the online meditation as I did not receive any message though I had given the email id as also my mobile number when I attended the Deep Meditation at Unnao on the 24th and 25th Nov 2012. TWO DAYS WORKSHOP IN PUNJAB WAS VERY NICE. NO WORDS TO EXPRESS OUR SUBTLE JOY. VIBRATIONS WERE TREMENDOUS. WE THANK ALL SAHAJ BROTHERS AND SISTERS WHO TOOK INITIATIVE AND CONDUCTED THIS PROGRAM AND THANK OUR DIVINE MOTHER SHRI MATAJI FOR GIVING US SUCH A BLESSING. It's really an awesome experience... the whole family remained extremely silent and was at whole peace in the devine presence of Sree Mataji, and the way it was broadcast was amazingly whole blessed. Thanks a million Sree Mataji for your attention that kept all the Sahaj brothers and sisters come together and seek for Sree Mataji's devine blessings online. It was really a blessed session. It kept everyone at home at extreme peace and utter silence. I didn't even know what's happening around, though my 2 years old daughter was running around me and making noise, I was in a state of complete peace. The devine vibrations I have experienced was beyond any words. Thanks once again Sree Mataji for keeping us in your attention and bless. Many many thanks to you for this LIVE STREAMING of you workshop. Every online session, the experience is unique and I personally felt, the intensity of vibrations and the state of meditation is improving every session. Previously I used to take some time to settle down with my thoughts, attention etc. but today from the start the vibrations could be felt strongly on Sahastrar and the effect lasts long like when we used to attend Sakshat puja. It's once again a great combination of stutis, songs and all these are nothing but a collective prayer. Very soon the whole Sahaja sangha will be under one form of worship of the Devi, at your lotus feet mother.. Thank you Shri Mataji for blessing us with these miraculous awesome moments in our life.. It is really amazing experience. Thank you Shri Mataji for blessing us. Subject: Blessings of Brahmanand !!!! Absolute Silence speaks and I have no words to express the Joy and Gratitude for such blessings I received for this birthday. Shri Mataji showered her Divine Blessings like Rain. Ekakarita (as told by our brother) was utmost and felt all through the session on both days. Only the Spirit was experienced and existed and nothing else. AtYourLotusFeetMother team are blessed by Shri Mataji to be instruments of the Divine to share this immense Bliss, Love and Compassion with all the Sahaja Yogis. I pray to Shri Mataji that we be blessed with more and more such sessions that help us grow within. Koti Koti Pranam and Abhaar Shri Mataji. Dear At Your Lotus Feet Mother. Even though was not able to be present for the whole two day workshop I still feel bliss for whatever time I dedicated to the Dhyan program. When its 10.30 am India its 9.00 pm Vancouver time, but still found some time to be part of the meditation program. Hoping to manage my day better to take full part and advantage in the coming months program. Meditation on 1st & 2nd December was so deep . May be Mother would be happy that her children was able to absorb her blessing and her power . We was really feeling that in our palms and on top of our head , and on whole body really so............... beautiful..
With this meditation hope that Our Mother will be happy with her children trying to bring discipline in meditation and desiring to reach the state where Mother wants us to be. In between when u say the state of meditation , that this chakra is clearing ,Mother's blessing is coming on palms , see the vibration Now , at that time when we also feel the same ,we are very happy that we also can know the same state of vibration and that we' ve also become part and parcel . Really so good that words cannot give the feeling . Once again Prannam to the whole team of At the Lotus Feet Mother meditation for this effort . Actually it was our UAE National day Holiday celebrating the spirit of the union . Awaiting for the next online ,Please Inform us the next meditation . 2. You really start communicating with Shri Mataji and tell your pure desires…and enjoy the fruits!!! 4. The main plus point of this meditation is , it helps to really surrender our problems in a better way and stop worrying abt any type of catches..When we keep taking her name"Shri Mataji" ,it gives confidence that Mother is always there to protect us from any type of situation…or many challenges we face in society..
Sahaj workshop organised at Jalandhar was a true blessing of our divine mother for all of us. As always it was full of vibrations and bliss, we enjoyed both days and felt World cann't be better then this. this has worked so deep inside that even after the workshop is over but, we can enjoy the same vibration only by remembering mother. we are feeling so light just like a kid, who is fully contented has nothing to worry at all. May our divine mother bless all of us and keep us collective to spread Mothers message all over the world. We thanks you all for organizing such a beautiful and blissful program online, this is a true blessing!! look forward for many more workshops in near future. I got the opportunity to attend the meditation program organized by the jalandhar collectivity. The arrangement were awesome and so the food. talking about the program it was a very nice meditation in the lotus feet of our holy mother. When the program started and after half of desiring blessing of shri mataji on our system then it felt that mother have poured all her love on her children desiring such blessing. vibrations are flowing from all over. and also one time i felt that there is a hole at the top of my head and cool breeze is pouring in. really great blessing. i bow my head at shri mataji's lotus feet and desire to gave such great a experience again and again. Dear Brothers and Sisters of our most beloved divine mother ‘Shri Mataji’ By the grace and blessings of Parampujya Param Paavani Param Kripaalu Shri Mataji I was blessed to be the part of this very blissful 2 days workshop for the first time on 1-2 December in Jalandhar. In the vicinity of our 'Parmeshwari' during the workshop session vibrations from starting till end were tremendous with holy divine bliss specially the start and end on the abode of ‘ Shri Viratangana Shri Shasrara Swami Shri Mataji’ I enjoyed the dissolved bhakti of all sahaji’s in and around the globe attending the program, through paramchaitanya I felt very serine atmoshpere and divine cool bliss on both palms and Sahasrara after crossing ‘Agyna’. And, it was all because of ‘Shri Matajis’ love for each one of us under the umbrella of her creation, wherein we all were connected whole heartedly in her divine kingdom. I, personally believe if we take her name “Shri Mataji” with complete surrender, devotion, dedication & faith all our worries are absorbed in her love and we feel very light and enlightened. Two days workshop held in jalandhar have no words to express our unque joy.we all enjoyed a lot.The flow of vibration was contineous and i was feeling like iam in haven with my mother.it was a beautiful collective conscious feeling.the maditation came as blessing like a sakshat puja for us. And i request you to all my brother and sisters that online maditation programme should be held once a week so that we can over come our negativities.we all ejoyed a lot really it is speachless.no words to express my feelings.jai shree mata ji. I would like to share my experience. Sahaja Yoga which means very simple spontaneous process through which one can achieve the connection with divine in extremely easy way but over the period of time I lost the meaning of "SAHAJA YOGA". With time being passed in Sahaja Yoga I started reading more and more and engrossed into other things as in treatments, clearance techniques, etc. and forgot the most important thing which is .."To see, to feel and pray for connection with mother in my heart", this made me mechanical and I lost the joy of spirit. Jai Shri Mataji and thank you mother for making us part of the universal family !!!!" We the Sahajyogies of Jalandhar are heartily grateful to Param pujya Shri Mata Ji Nirmala Devi to give us an opportunity to arrange a seminar. We are thankful to all the Sahajyogies who came to Jalandhar from far away and those who attended the program online. It is by the grace of our dear Mother that She let "AT YOUR LOTUS FEET MOTHER" team to manage such an awesome program. By the power of 'VISHNUMAYA" sahajis all around the world were able to attend program at their respective places online. Everything went on so smoothly .So much of vibrations and a state of complete thoughtlessness was felt throughout the seminar because of the meditation and melodious bhajans sung by the team. It seemed as if some spiritual power is doing everything .Full grace of Maa Annapurna was felt by everyone at every meal. One of the sahaji sister told that during meditation she had severe catch on her agya chakra .Soon she felt as if Shri Mata Ji is asking her to forgive every one, as soon as she did so ,the catch was released and she felt extremely cool vibrations on her sahastrara, which she never felt before. we all are still enjoying that state of thoughtlessness which is a great boon for us wishing to enjoy this type of programmes in future also, we bow at "THE LOTUS FEET OF MOTHER" which is our ultimate goal. We are so furtunate and million thanks to Shri Mata Ji, that able to attend Meditation Program in Unnao. This was so joyous for us, and Our Divine Mother continue showering the cool-breez/ Divine Love in the Unnao Area since last Saturday. Parama Pujya Shri Mataji has gifted us all a divine opportunity to collectively meditate and offer prayers at HER Lotus Feet. We are extremely pleased to invite everyone for an on line meditation program, on the request of Bahrain collective, on 15th November 12, Thursday, which is also New Islamic Year day and Diwali Puja day for Bahrain,UAE/Middle East. Timing: 10.30 am (India), Bahrain (8 am), UAE (9 am), Turkey ( 7 am), Italy (6 am), Australia (4 pm), Austria (6 am), France (6 am), Moscow (9 am), Germany (6 am), Romania (7 am), UK (5am), Vancouver (9 pm) onwards. Jai Shri Mataji ..... !!! We , The Forunate Few of Bahrain Sahajayoga Family , Thank you , our very dear Sahaj Bros of Delhi , For the Blissful Meditation They Took Us into , on the 15th of Nov .....where in Shri Mataji's Grace and Attention was Evidently Felt Throughout !!! It was Indeed an Immensly Fulfilling , Overwhelming and Unique Experience for each one of us !!! Although it should be a known fact to all Sahajayogis that There is no Sahajayoga Without Shri Mataji.....we fail to acknowledge it many a times .....we give more importance to The Knowledge of Sahajayoga than the Source of Sahajknowledge , which is none other than Shri Mataji !!! But you , our dear bros took us on a Journey of Complete Bliss Along With The Mother Of The Universe , Shri Mataji !!! That made the Journey so Joyful, so Blissful and So Satisfying , with absolutely no Compeltion of any sort ....So much that Time didn't prove to be a barrier at all ....!!! JAI JAI JAI SHRI MATAJI !!! Thanks for the online meditation arranged on 15th Nov. 2012.
meditation. We all felt Shri Mataji’s presence and blessings. I don’t have any words to express my joy. At the out set i sincerely convey my thanks from my heart to the team, who has given the Online Meditation today morning on the request of our Bahrain Collective. with my knowledge with excellent vibrations.as you said, we should hv strong desire in our heart to be in nirvichara then definitely, mataji takes care us and keep us in the state of thoughtless awareness. I once again convey my thanks to all the team and waiting to attend many more sessions like today in future. The meditation session on 15th November was a real blessing, a clearance of the Mahalakshmi channel, preparing for the Diwali puja we had in Dubai in the evening. Due to this meditation I could absorb the vibrations and enjoyed the puja in a complete balanced and silent state. Meditation was very blissful peaceful very very nice and beautiful. There are no words to express the silence felt and could feel silencing of thoughts. Attention got fixed, enlightened and stable. All through the meditation and the entire day the divine cool breeze as Divine Vibrations was flowing and did the work of an AC. Can still feel the lightness within even today. The meditation session conducted in this way makes it so easy to connect to the Divine Mother, to be one with Shri Mataji in a thoughtless state in deep silence within. There are no words to express this deep meditative state felt. How I wish we are blessed with this meditation every fortnight. Thank you brothers and sisters and all AtYourLotusFeetMother team for sharing your love through such meditation sessions. The bhajans are so so so beautiful, blessing from the Divine that you all sing from your heart. It takes me into deep meditative silence every time a bhajan is sung by you all. I enjoy every bit and every time the session gets over I am again waiting for the announcement of the next session to receive the blessing of being in the global collective. Our profound thanks to Shri Mataji and her instruments at your lotus feet team for organizing an online meditation session. The day coincided by the Divine Grace it was Islamic New Year day as well as prior to Diwali Puja. Most of the brothers and sisters at Bahrain Collective assembled in one of our yogi brother's house and the atmosphere resembled Sakshat Puja. Very intense meditation with deep silence and barely we noticed the hours spent until Nikkuji apologetically announced it is longer time already. In fact our heart was longing for more. When we are sitting in the lap of our Mother, no botheration about time, thirst or hunger, isn't? After the meditation, we were talking to each other about their experience but everyone felt the same, especially when the left and right nadi clearing was going on. It was a tremendous feeling as if Shri Mataji was sitting on the dais during puja. Every session teaches me something new, during Navratri session it was "without Mother, there is nothing in Sahaja Yoga" and today it was "Mother is the Destination". The proof of oneness is the fact that almost everyone present there had similar feelings and vibrations during each stage of meditation combined with soul kindling songs. In short, we felt the presence of Shri Mataji more intensely and for us this was the puja. We pray to Shri Mataji to bless us with more and more such sessions and let the entire Sahaj Sangha realize the beauty and importance of effortless meditation. All Glories to Our Mother and thanks for introducing us to Her strong instruments, At Your Lotus Feet Mother. Thank you brothers for guiding such deep meditations. I wonder if it possible somewhere to mentionh wich talks of Mother you had been using just in case if someone would like to listen for a full talk. Subject: What a wonderful meditation today! What a wonderful meditation today! Thank you so much for this effort. So effortlessly we could enjoy being at Her Lotusfeet. Thank you again and again Shri Mother. P.S. Please inform me again when there will be the next online meditation. undementioned list comprise of yogis from middle east (apart from UAE)- Qatar, Kuwait, Saudi, Oman, Iran. Also from Australia, Hungary, USA etc. The unconditional love from the team of 'At Your Lotus Feet Mother' is so inspiring. Sure, one day we all will be part of the same Team. Please join with timings and Link per trail mail in respective countries and also inform as many Sahaja family members as possible. By the Grace of Shri Mataji we all will yet again experience sitting together (wherever we will be) under one canopy (pandal) of Her Aanchal spread all over the World. Dearest brothers and sisters, On the auspicious occasion of Vijay Dashmi/ Dushehra lets all pray, meditate and become one with Shri Adishakti Shri Mataji. We humble pray to H.H.Shri Mataji to be with us and bless us for this meditation program on 24th October 2012, Wednesday, evening 6.45 pm own wards, Indian Time. The program would be in Hindi language mainly and partly in English also. The experience this time in online meditation (24 Oct 12) was unique.When I sat for the meditation, the state was not good and the joy was lacking. so when we began, I was just feeling that there will be someimprovement and was not expecting that I will get much cleared. And when we started taking the name of our Holy Mother, slowly slowly things started improving and after about an hour I was somewhat better. But then, as we prayed for more and more humility and pure desire and surrendered, the joy of remembering revered Mother started coming. And to my pleasant surprise, there was tremendous clearance which occurred and was at the peak as we left all our problems at the Lotus Feet of Shri Mataji. The experience of praying for thoughtlessness by surrendering the agnya chakra was also very strong. During the end I could just remember our most loving Almighty Mother and felt that now I dont need anything; I am just enjoying bowing down in front of my Great Great Divine Mother. I feel that there was a definite transformation, a permanent positive change after attending this online program and I am deeply indebted to the Divine for giving me the opportunity for attending the program and take this opportunity to bow down and express my heart felt gratitude to our Most loving, Most Powerful and Omnipresent Holy Mother, Shri Mataji. The confidence that our Mother will be with us whenever we simply open our hands humbly and desire form our heart for Her blessings, has grown stronger with this program. the organisers of this online program. 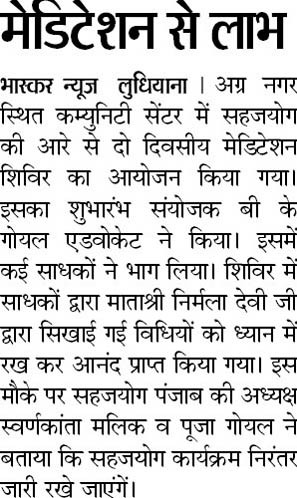 Its a great news for all those who really desire only for the meditation in sahaja yoga. There will be an online meditation on 24th October at 6:45PM IST where there is meditation and its an amazing . I have attended it before also. So, many of us really desire mother for giving us chance to feel more vibrations. so here is the chance. cash it. Sonal Sharma i have attended this meditation program and its really very nice and alot to be practically experience....we can feel the practical change in our state ans system before and after meditation. aninda 28 October 2012 8:54 PMbeautiful bliss experienced on vijayadashami.. innumerable thanks to mother and thanks to all sahaji brothers who are conducting this. Anuj Sharma Amazing experience with another ONLINE MEDITATION session(Today) on Vijay Dashmi. 24th Oct from 6.45pm to 10.30pm (IST). Looking forward another session. Congratulations guys. Good job done...!! Jai Shri mataji..! October 24 at 10:40pm Seen by 49 Anamika Nigam, Rakesh Bisht and Pankaj Sharma like this. Sumit Shah it was very amazing. From: nath divyendu bonny1947@yahoo.co.in The online meditation programme changed completely my perception of shrimataji's alter at my home.It has given a new dimension to my meditation process that i practiced on daily basis prior to this online meditation programme. My mother is now more close to me and is more responsive.I is a pure desire of mine that i attend every online meditation programme without fail. DIVYENDU NATH .RANCHI . JHARKHAND. Mob: 8603119195. From: Smita Jaisalmeria Subject: Oct 24th meditation program Dear bhaiya, Jai Shri Mataji!! It was awesome! Do not have the words to express. So much of thoughtlessness, felt kundalini all the time in Sahastrar. Thank you sooooo much!! Please keep conducting it! It was such an auspicious & blissful experience I ever had. The environment was full of vibes. Although my internet was not connected properly and I was listening the voice in installments but then praying to Mother helped a lot. BEAUTIFUL!! My cousins were watching popular serial Bade Ache Lagte Hain & they were not ready to switch it off but it was such a Wonderful Connection that I never got distracted. Thank you. I have read all the comments. My observations are that if all of us try, very sincerely from our hearts, to keep our Divine Mother pleased by our Bhakti, Shraddha and Samarpan ( just like Shri Ganesha), by dealing with all SYs with love and compassion, by being patient, and by giving self realisation to maximum people, we could all feel our Divine Mothers love all the time. However the conditionality is that we have to be tested at every stage whether we are fit to go to the next!! This is where many of us are floundering because we are not following the norms laid by our GURU and GOD. It would be indeed a blissful life if we were all in the NIRVIKALP stage because then the drama around us would also disappear as there would be no doubts left. Let us pray to the Beloved Mother for HER guidance and benevolence in this regard. In the meantime keep up your good work. We pray to Shri Mataji to bless us to enjoy many more meditation programs and feel bliss within. We thank all the brothers and sisters for making this happen. Can we send bhajan request? Dear all, this particular day on Dussera we all had tremendous experience of total lightness in our whole body and emptiness in our mind& brain. It was joy of being relieved of all the worldly matters. This Online meditation shud reach nook & corner of the world to bring out the Hidden,Forgotten and Ignored TRUTH to One & All. We all thank Shri Mataji for the day to day experience that happens with us to be one with the ABSOLUTE. it was really very nice at farukhabad. we felt so much lightness in our body then could not be explained in the words. I want to share an experience I listened when coming back to Moradabad in bus. there is a sahajayogi in the bus who is also coming from the program and going to bareilly. His name is Banwari Lal. He is from a small village near Bahedi in UP. he told me that when the brother from delhi sang a bhajan "Nir Bhay Nir Gun " then he said that he don't know where he is , he is so much with shri mataji and also said that he felt like in the whole room there is shri mataji and him and no one else. he further said that his arms , legs felt numb with vibrations and he actually could not feel his body and he have to pinch himself to confirm that his hand or legs or body is here. he could not tell the experience in the public because he was feeling shy. may maa give us all, the true meditation which she actually want to gave us.